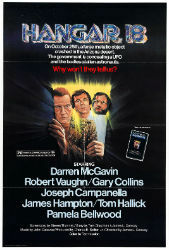 A trio of astronauts are caught in an accident, when they witness a newly launched satellite collide with a UFO. Back on Earth, they find themselves the scapegoats of a conspiracy to keep the downed craft quiet. A group of politicians plot to hide the discovery of aliens until after a presidential election. Meanwhile, some scientists explore the captured saucer and discover it’s occupants may not have come in peace. Hangar 18 opens with an unintentionally hilarious spinning decapitated head in space that immediately dissolves the scene of any shock or horror .The film then goes through a series of tension building set-ups, only to bungle them. This happens all the way to a final moment that could have lead to an ironic finale, but instead decides to drag-on with a lengthy voice-over that renders everything you’ve seen up to that point meaningless. The dad from Teen Wolf and that guy who was on Love, American Style all the time, together at last. Hangar 18 is frustrating because has a promising idea. It looks as if the film is going to show an alien cover-up from both sides. The political maneuvering that sets the whole conspiracy in motion is a little more interesting than the rote, “People will panic,” excuse that is trotted in similar stories. We are shown very little of the actual workings of the conspiracy, and about forty minutes in it’s virtually forgotten for scenes of not so menacing men in black chasing two middle-aged astronauts around the desert. 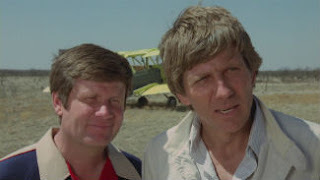 This is does allow the movie to offer up some surprisingly good stunt work, and it was great to see two men who are in no way tradional action heroes have a chance to get in fistfights and blow-up cars. While the astronaut’s story serves to deliver the occasional action beat, it’s undermined by a parallel plot concerning the actual investigation of the flying saucer. Initially the exploration of the spaceship is intriguing. The interior seems far larger than the exterior would allow. If this was deliberate, it is never commented on. The interior of the ship feels like something out of Battlestar Galactica, all chrome and black plastic. The aliens themselves are a letdown, although the story justifies their appearance, it fails to make them very interesting. 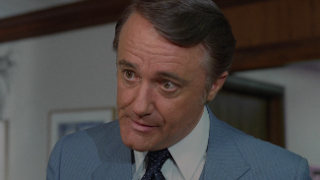 Robert Vaughn, shortly after watching the final cut of Hangar 18. Say what you want about the quality of Hangar 18, it has an impressive cast. Nearly everyone gives a good performance, hampered only by some awful dialogue. Gary Collins and James Hampton make good unassuming leads. I don’t quite buy them as astronauts, but they work together well enough once on the ground and in the thick of things. Robert Vaughn and Joseph Campanella are delightfully sleazy as politicians trying to keep the aliens under wraps while sitting out an election. Darren McGavin flails around and chews every scene he can. He’s far and away the most fun to watch, and manages to breath life into the film when it threatens to flatline. Hangar 18, is a mess. It constantly falls short of it’s aspirations, but it does have the occasional notable moment. It’s a not a total loss, but I would definitely go in with lowered expectations.